Earlier this month Google released Google Earth 7 (beta) which also updated the latest version of the Google Earth web plugin. Two significant changes for how real estate is showcased in Google Earth have been revealed. The first is a change to how colours are displayed, due to a new 3D software rendering method that Google has introduced with version 7. The result is a gradient effect on polygon surfaces that adds a new brightness, especially to our visualizations at Cube Cities. 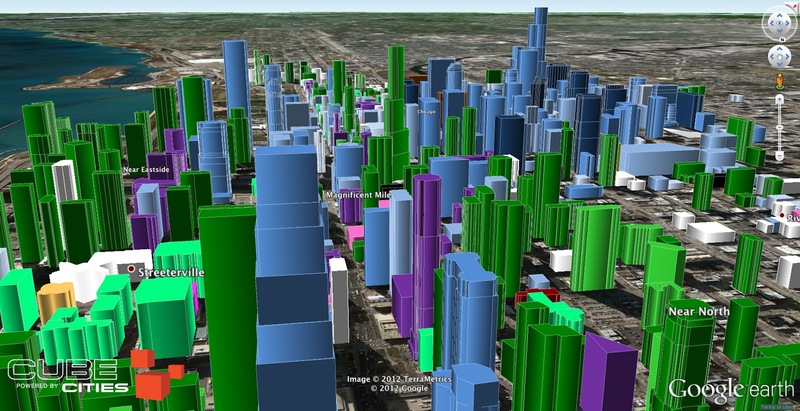 See the differences in the screenshots of Chicago's skyline below. Secondly, Google has introduced their auto-generated, 3D city models to the desktop with Google Earth 7. This means that users will see entirely new cities of 3D building imagery when updating to the latest version, and will see the same 3D building content that is visible on Google Earth for iPad for cities with this new coverage. Currently the largest cities with this coverage are Los Angeles, San Francisco, Seattle and Denver, but the list is growing. The video clip below shows transitions between the legacy building layer (consisting mainly of the 3D buildings from Google's 3D Warehouse that was recently sold to Trimble) and Google's new 3D imagery. The direction of travel through San Francisco is Northwest along the Market Street corridor toward the Ferry Building. 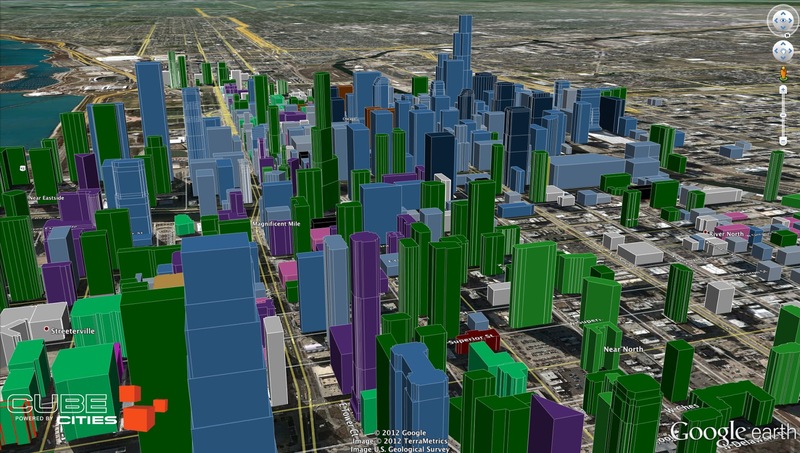 Access to both the legacy and new 3D buildings remains available through the Google Earth web plugin in cities that have coverage from both sources. However, beginning with Google Earth 7 on the desktop, users will by default be shown the new 3D imagery in cities where there is coverage. Google has emphasized that their new 3D imagery technology will improve and the coverage will continue to expand. Click here to download Google Earth 7. With the release of Google Earth 7, Google took time to launch three-dimensional images to new metropolitan areas, including Avignon, France; Austin, Texas; Munich, Germany; Phoenix, Arizona, and Mannheim, Germany. Google earth is best thing to analyze the real estate industry. Agreed, very strong linked between both real estate and Google earth. Developers buy land, finance real estate deals, build or have builders build projects, create, imagine, control and orchestrate the process of development from the beginning to end. Developers usually take the greatest risk in the creation or renovation of real estate and receive the greatest rewards. Thank you. Cube Cities Direct Link: "View it in Cube Cities"